Is Burnside too rich for the Greens? Is Burnside too rich to be a Greens? 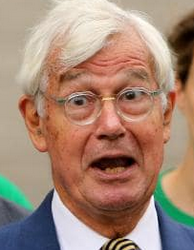 Greens candidate Julian Burnside has done very well for himself—a clever lawyer and a shrewd property investor—$20 million in the can. There’s probably more elsewhere. But two words come to mind, conflict and hypocrisy. This article in The Australian today might go some small way to explain that. It won’t, however, explain why people with wealth before they enter politics like Turnbull and Burnside would bother. At least Turnbull via the Liberals attained PM, the highest order. Burnside chose the bloody Greens who offer nothing more than a position as a security guard at his three apartments on Finger Wharf in Sydney. You might see him in a black uniform peering out from behind those funny spectacles like a mouse trapped in a wine bottle. Julian Burnside, a wealthy barrister who has amassed a $20 million property portfolio including a Victorian mansion, multiple waterfront apartments in Melbourne­ and Sydney and a spectacular clifftop beach retreat, wants to end tax breaks for future investors. The property wealth of the Greens’ candidate for Kooyong, some of it hidden within company structures or registered to his wife, sits in gleaming contrast to the policies of his new party, which laments a “rigged’’ housing system that enriches investors while locking first-time buyers out of the market. If the Greens’ housing plan comes to fruition in the next parliamen­t, negative gearing will be scrapped for all new property purchases, current property investors will be allowed to negatively gear only one property and the standard 50 per cent tax break on capital gains will be abolished over five years. Labor, which will rely on the support of Greens senators if it forms government after the expected May election, has pledged to halve the capital gains discount and limit negative gearing to newly constructed dwellings. None of these changes will put a dent in the wealth of Mr Burnside, a $15,000-a-day QC who, despite his preparedness to work pro-bono for refugees and other human rights causes over the past 20 years, has managed to acquire 10 properties. His only mortgage, a loan taken out 17 years ago, is on the Hawthorn mansion, his primary residence. Mr Burnside declined to say whether he had used negative gearing — deducting losses from rental properties from his taxable income — to amass his property holdings. Asked whether it was hypocritical to deny future invest­ors benefits available to him when he built his extensive portfolio, Mr Burnside said the system needed to change. “As Treasurer, Josh Frydenberg has done his level best to prop up a system that benefits people like me more than first-home buyers and I don’t think that’s fair,’’ he told The Australian. “He’s running to back in a system that gives out billions of dollars in tax breaks while saying we can’t afford to raise Newstart or fund a rapid transition to renewable energy. • Two apartments with uninterrupted views of Melbourne’s Port Phillip Bay on St Kilda’s Marine Parade, one registered to Ms Durham. • Houses in the inner-­Melbourne suburb of Clifton Hill and gold rush town of Ballarat. The Greens Housing Plan, ­announced in 2017 when housing affordability was at a historically low ebb aims to redistribute property assets from people with two or more investment properties to first-time home buyers. Greens leader Richard Di ­Natale yesterday said the money saved from phasing out the tax breaks would be put towards health and education. Mr Burnside’s investment portfolio, which will not be affected by any of the proposed changes, has ridden a 30-year ­period of sustained property price growth in Melbourne and Sydney, fuelled in part by negative gearing and capital gains concessions. For much of this time, Mr Burnside was a Liberal-voting commercial lawyer. He acted for wealthy clients such as Alan Bond and Rose Porteous and was counsel assisting for the Australian Broadcasting Authority “cash for comment’’ inquiry. He voted for William McMahon against Gough Whitlam in 1972, Malcolm Fraser against Whitlam after the dismissal and John Howard against Paul Keating in 1996. Until recently, he was a member of the Melbourne Savage Club, a men’s-only club that counts Robert Menzies among past presidents. His politics shifted dramatically when he met and married Ms Durham, his second wife, who, for most of her life, was a staunch Labor voter. In 1998, the year they wed, he took up the cudgels for the Maritime Union of Australia in its epic battle against Patrick Stevedores. In the wake of the Tampa crisis, he represented Liberty Victoria, on behalf of asylum-seekers, against the Howard government. Legal sources said that as his pro-bono work expanded, his commercial briefs dried up. Another asshat lawyer, just what Parliament needs. He’ll get nowhere. We do indeed say “wanker”! The definition of a Green is someone who has had his DA approved, and is now worried about the environment. Sounds like he’s Too Green for The Greens? His dumb speak is right on though! He’s go down well for the Democraps in the USA! A good Greenie should be rich enough to live like Marie Antoinette and be completely insulated from the reality of everyday life. What a complete and utter fraud he is. So he’s got all the benefits over half-a-century and now wants to pull up the drawbridge for everyone else. How low can you get. It’s fine for him but you, YOU, can get f@#$ed. Isn’t it amazing the amount of slimy barsteds climb out of the wood work when an election means they might get their snouts in the trough. Next post: The stench of corruption in the air?